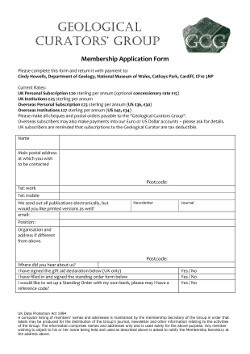 Membership of the Geological Curators’ Group is open to anyone interested in geology, and will be of particular interest to any individuals or organisations responsible for the care of geological collections, the interpretation or promotion of geological specimens or sites, as well as conservators, historians of geology, volunteers, collectors or preparators. If you wish to see an improvement in curatorial standards, and increased awareness of our geological culture and an appreciation of its great heritage, join GCG now! Meetings, seminars and workshops are held several times a year covering a wide variety of themes, and held at various venues, usually in museums. Joint meetings with related organisations are especially fruitful. Field trips frequently accompany summer meetings. The Geological Curator is the Group’s peer-reviewed journal and was first published in September 1974. It contains articles pertaining to all areas of interest for Group members including historical articles, techniques of conservation, preparation and display, reports of meetings, as well as reviews and news. Coprolite is the newsletter of the Group and complements the Geological Curator. Published four times a year, it contains up-to-date news of meetings, people, exhibitions and events as well as other ephemeral matters. A website with job vacancies, a map of UK regional geological collection, archived publications, links to suppliers, and other useful information. The help, advice and comradeship of a profession dedicated to its cause. Membership is priced to be affordable to all, and only increased when absolutely necessary. Subscriptions for 2019 are due any time from now on, but before paying, please check that you don't already have a Standing Order with us. The amounts will remain the same for 2019. The membership database on our website will will be reset over Christmas, so that you can renew your subs that way from January onwards. if you are still in arrears from previous years we will try to include that as well. You can now join Geological Curators' Group online. Subscriptions run until the end of the calendar year. Follow the links below to choose your membership type. This subscription is for individuals resident in the UK who wish to join the group and receive GCG publications and "members" rates for events. It is not for those living outside the UK or institutions. This subscription is for UK institutions, for example museums and trusts. Please provide the name of one person who will act as primary contact. The institution will receive one copy of each journal and newsletter. Staff or volunteers at the institution will be able to attend GCG events at the members rate, but they have no voting rights at any meetings. This subscription is for individuals resident outside the UK who wish to join the group and receive GCG publications and "members" rates for events. It is not for those living in the UK or institutions.